In United States of America, the word and concept of patriotism are an active part of the country’s political and social vocabulary especially since the events of 9/11 and the subsequent wars in Afghanistan and Iraq. 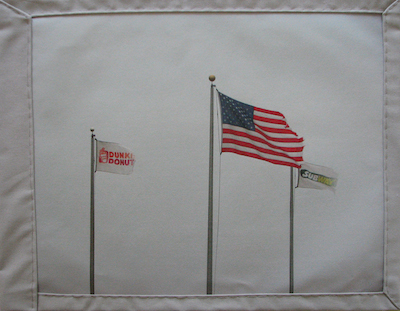 The American flag thus is displayed throughout the country’s landscape becoming a visual language for U.S. citizens to show their love, loyalty, and support for their country. However, some of the ways the flag is presented and used (i.e. commercial objects and clothing) are questionable and makes one wonder if patriotism has become an idea ridiculed by consumption and commercialism. Furthermore, United States in its unique making as a country configured by the conjunction and diversity of cultures makes the meaning of the word patriotism a vague one. Immigrants from every corner of the world have made of this country not only their home but also their homeland keeping it as close in their hearts as the one they came from. It’s My Flag, three flags made out of photographs taken from the everyday, and Homeland of Many Nations, a flag made out of 256 American flags (one for each country in the world) explore and present these two notions.